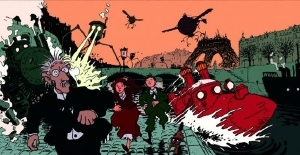 From Jacques Tardi, the writer of the comic series The Extraordinary Adventures of AdÃ¨le Blanc-Sec comes his first feature length film which is set in France in 1941, a country stuck in the 19th century, governed by steam power and Napoleon VI. The scholars mysteriously disappear and a young girl, Avril, sets out in search of her parents, two missing scientists. Currently in production, there's no release date. Looks like a British animation to me. Che carino! veramente un grande progetto!mi sono sempre piaciuti i fumetti del grande Jacques Tardi!